Luxor Game Review - Download and Play Free Version! Fast-Paced Puzzle Action That is Hard to Put Down! Fans of Zuma: Luxor Gives You Even More Fast-Paced Puzzle Action! Action-packed and entertaining, Luxor is a new game a lot like the classic arcade-style game Zuma, only even better! Stop a steadily advancing line of colored balls by shooting more balls at it. Match 3 or more in a row, and they'll explode and disappear. Don't let the balls reach your temple at the end of the line! It's a very simple concept - easy to learn and fun to play - but it takes quick reflexes and steady decision making. Do you love the addicting gameplay of Zuma and other games like it? If so, Luxor is perfect for you! Help the Mysterious Goddess Isis Battle Set and His Evil Minions! Luxor takes you on a once-in-a-lifetime, all-expenses-paid trip through the mystical magical world of ancient Egypt! Enjoy yourself, but be careful - you've got an important job to do. This is no leisurely vacation! Set, the god of darkness and chaos, is determined to envelop all Egypt in his terrible grasp. Each line of balls is pushed along by one of his beetle henchman - stop them by eliminating every ball in the line! You're the only one who can help Isis keep Set's evil forces at bay and save the land. With 88 levels to complete in 12 stages, the journey will not be short or easy - but it will be fun! Luxor's 88 levels take you to all the fabled places of Egypt, starting in Alexandria and moving to Tanis, the Pyramids, the great Sphinx, Karnak, the Cataracts, and more. Use your magical winged scarab to shoot balls of red, green, blue, and yellow. As you go along, the game adds more colors and gets more challenging, but your skills grow too! Luxor is presented with a clean, clear interface that perfectly suits its brilliantly simple gameplay. All the levels take place set against interesting Egyptian illustrations and motifs, and there's a map to keep track of your progress as you move through Egypt! For a Crucial Edge, Collect Power-ups Dropped by Isis Herself! This is where the Luxor pretenders are separated from those who truly have what it takes to protect Egypt from disaster! Collect 30 golden Ankh coins to earn an extra life. When you eliminate a complete line of balls, grab the resulting gem for a big points bonus! Power talismans give you special abilities for a short time, and they often make the difference between victory and defeat. Stop, reverse, lightning bolt, fireball - see if you can grab them all! Luxor comes with a complete set of graphics, music, and sound effects of a caliber rarely found in an arcade-style game. As the game's intensity increases, the music quickens - everything fits perfectly! Enjoy the original score and thrilling sound effects that make the game even more fun. Can you help Isis thwart Set's diabolical plans and save Egypt? Find out today and download Luxor! 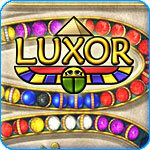 Luxor is an exciting puzzle game with a unique Egyptian theme with gameplay that will be familiar to anyone who has ever played Zuma. A long chain of colored spheres follows a path towards a pyramid. You've got to create matches of three or more spheres and destroy the chain before it gets there, or it's game over. There are tons of levels to play with a variety of paths to deal with. Bonuses and powerups are thrown in to add to the action and help you along the way. Luxor is simple enough for anyone to get the hang of, but still packs quite a challenge. The gameplay is very similar to that of Zuma Deluxe, with a few noticeable changes. 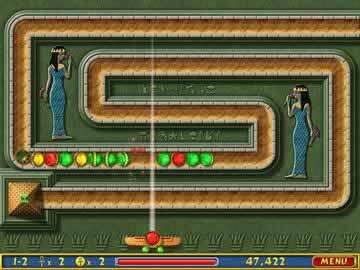 In Luxor, you control a winged scarab at the bottom of the screen that can move left and right. This scarab fires different colored spheres that are destroyed when matched in groups of three or more. The scarab holds two spheres, often different colors, that you can easily switch between as well. This gives you the ability to save some spheres or switch to one that will give you a match right away. Above the scarab is a long winding path that makes up the level. 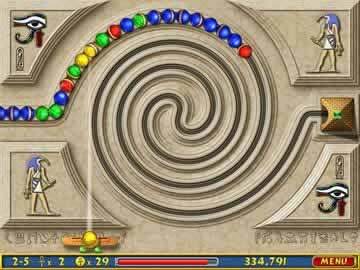 Long chains of colored spheres like the one fired from your scarab follow this path, which ends at a pyramid. Your goal is to create matches and eliminate the chains before they reach the pyramid. Failing to do so will cost you a life and force you to restart the level. As you create matches, various items will fall toward the bottom of the screen. You can move the scarab to catch these items and earn bonus points, more lives, or powerups. Powerups may slow the spheres, destroy them, or even make them move in reverse. It sounds simple enough, but can present quite a challenge on later levels when the difficulty ramps up. There are over 80 different levels to play throughout the game. Each level presents a unique path for the colored spheres to follow, and some levels even have you dealing with multiple chains of the colored spheres at the same time. Some levels have paths that travel through tunnels you can't fire into, or paths that wind around and limit your line of fire. The levels range from the simple and easy to the extremely complex and challenging. The biggest downside is that despite the differences and changes that occur from level to level, there isn't much variety in the action. The gameplay never really changes from start to finish, and there are no modes to add some variety or choice. The difficulty level in Luxor starts low and continues to ramp up as you progress through the game. You start with slow moving chains on simple paths and only a few sphere colors to deal with. As you beat levels, the speed of the chain and complexity of paths continue to increase (and some levels have you dealing with multiple chains at once, a challenging task). The number of colors you need to deal with slowly increase as well, with up to eight different colors to manage. Unfortunately, the game does not provide any options to change the difficulty level. Such an option would have been a nice addition to improve the game for players finding it too hard or too easy. The controls for the game are few in number and simple to use. You move the scarab left and right by moving the mouse. You fire colored spheres with the left mouse button, and switch between spheres with the right mouse button. Those few controls are all you need to know to begin your Egyptian journey in Luxor. Luxor does a great job when it comes to presentation and the theme. The visuals all fit well in the Egyptian motif. The background art, the designs of the winged scarab and colored spheres, and even the pyramid at the end of the paths all help build a consistent theme. The music and sound effects also fit perfectly. There are also sound cues that let you know when something is happening. For example, as the spheres get closer to the pyramid, you'll hear a heartbeat that adds to the excitement and suspense. When you put it all together, it is a great experience. Overall, Luxor is an excellent game that's very similar to Zuma. There are a ton of levels to take on that provide a variety of challenges. The controls and gameplay are simple enough for anyone to pick up and play. Working towards bonuses or grabbing powerups adds to the excitement. Great presentation makes an already great game even better. There isn't a great deal of variety when it comes to the action, but that's not unusual for this type of game. The flaws and annoyances pale compared to the positives of the game. Whether you're a puzzle player or not, don't hesitate to give Luxor a try. Watch a few minutes of gameplay from this action-puzzler and some of the various stage designs you'll come across as you work to blast those balls before they reach your pyramid.